Despite the dreary start to the day, the weather cleared up nicely. I had one of my windows open for a while, and it felt like spring. The air felt so fresh. In celebration of such a wonderfully spring like day, I had felt like a little DoFU Fa. 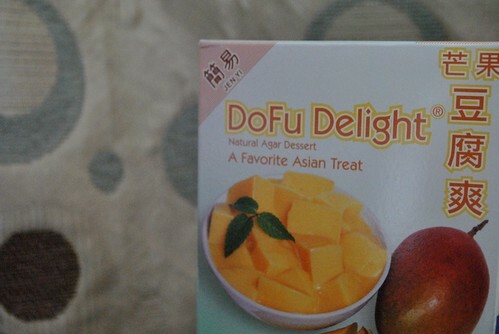 What is DoFu Fa you ask. It’s like a Chinese version of Jell-o. 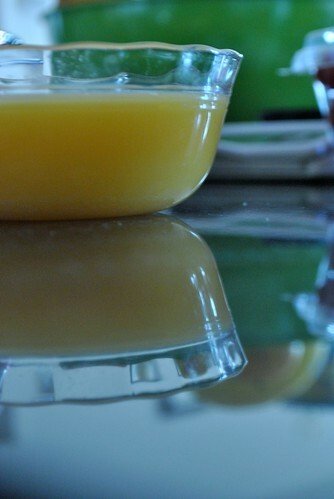 Except less citrus-y and there is milk in it. I love this stuff. It isn’t as sweet as Jell-o and it just feels more refreshing. If you ever go to Dim Sum, the coconut flavor is traditionally offered with some canned mixed fruit on top. Today I picked up a box of mix at my local Asian Supermarket. I went with the Mango flavor because, honestly, it would probably photograph better. While I was there, I also picked up a can of coconut milk. In this Asian market, there was an aisle devoted to South Eastern Asian foods (this is also where you find Banana Extract too). There, I found a rather large selection of brands and types available for my choosing! Hmmm…which should I use? After some inspection of the ingredient lists, I found two types. They are all called Coconut Milk, but some listed the ingredients as coconut extract and water, while others listed coconut milk and water. Interesting. I ended up choosing a can of Organic Coconut Milk. The ingredients were: Organic Coconut Milk, water and Guar Gum (thickener). Making the mix was a snap. If you ever made jell-o, the steps are basically the same. First you heat up the powder in 3.5 cups of water and bring it to a boil. Then take it off the heat and add 1.5 cups of whole milk. Whole milk makes it creamier, while skim milk can also be used, but it will feel a little thinner. Once it’s been mixed well, pour into individual bowls or into a single dish and let it cool to room temperature before letting it set in the fridge (I used three individual bowls and a glass loaf pan). After it sets (a few hours), I made some whipped coconut milk to serve on top. 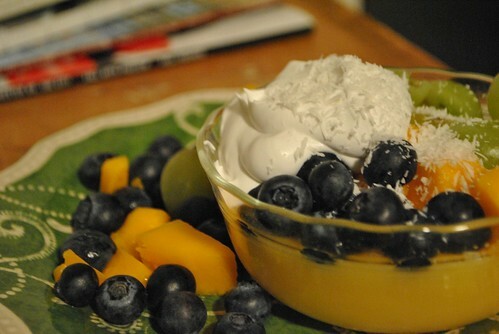 The whipped coconut milk was something I found on a blog called Mark’s Daily Apple. It’s actually really interesting and easy to make. I highly recommend it as summer comes along in lieu of the more traditional (and heavier) whipped cream. 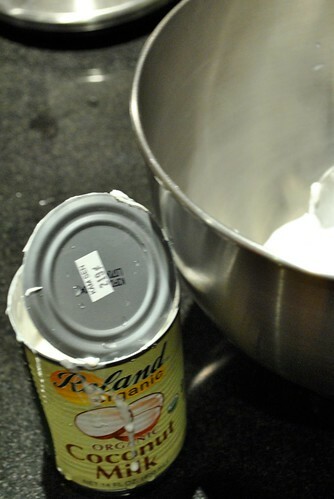 First, you refrigerate a can of coconut milk for a few hours (overnight is probably best). 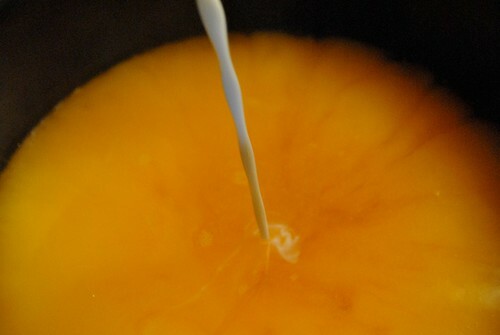 Then you crack it open and spoon out the top layer of cream. I’ve done this twice. The first time I got very little of the cream before i reached the liquid. I’m thinking it’s because that can was probably a milk that was made of extract. This time, I only refrigerated for a few hours, but I got much more of the creamy stuff out of it. Save the rest of the liquid. If it’s still milky, it goes great on oatmeal! Scoop out the cream and put it in a bowl for a stand mixer (use the mixer, it takes a bit more time and effort to whip this up). With the wire attachment, set it on medium speed and let it rip until it gets creamy, with stiff peaks. 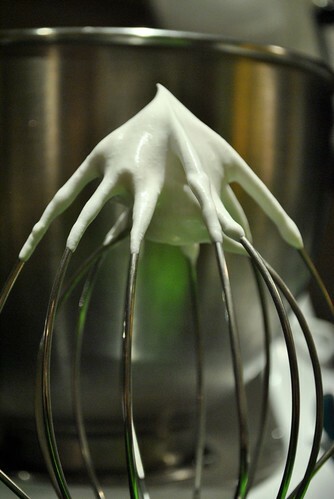 It will have the consistency of softly whipped cream. 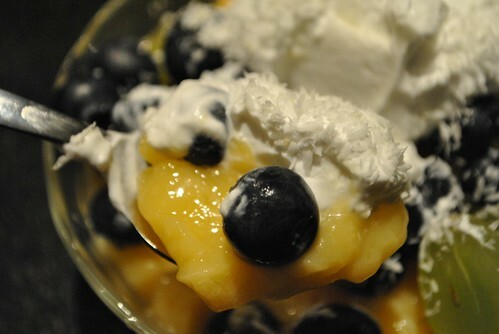 On top of each bowl of DoFu Fa, I added some fresh grapes, mangoes, blueberries and topped it off with a generous dollop of the whipped coconut milk. I also sprinkled some unsweetened coconut flakes on top. So summery, so refreshing, and so super easy to pull together! We’re almost out of winter…yay! 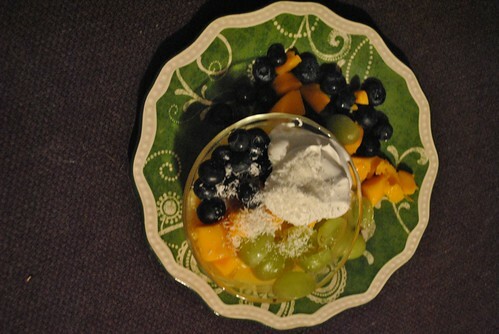 This entry was posted in Dessert, Fruit, Uncategorized and tagged Coconut Milk, Dessert, Fruit. Bookmark the permalink.